How to Cook Indian Food without Oil. Dal Tadka Recipe. Restaurant style Lentil soup. Masoor Dal Tadka is one of the better known dals as it is generally available in Indian restaurants. Oil-free Indian cooking. I generally use low amounts of oil in my cooking. Just a fourth or half teaspoon is enough for the tempering (esp with whole spices) or spray for baking or other needs. I often get asked about how to cook Indian food without oil and have been meaning to write up this post for a while, probably months now. I cooked some dishes without oil to figure out what works best in terms of tempering whole spices, ground spices, how some traditional Indian recipes would need some adjustment and so on. Here is how to adjust Indian recipes to be oil-free. These adjustments also apply to cooking oil-free in general. Whole spices are often tempered in hot oil in many Indian dishes like Dals, one pot meals, mains etc. When the oil is hot, spices are added to it. They are cooked until they get fragrant or change color or start to pop. At this point the spices infuse the oil really well and the oil acts as a carrier to infuse the rest of the dish. To temper the whole spices without oil, the tempering process can get divided into more than 1 step or the order of the recipe is changed. 1. You can dry roast the spices until they change color and continue with the rest of the steps of the recipe. Use water or broth to saute onions/veggies once the spices are roasted. 2. You can dry roast the spices, remove them from the pan, and add them back to the pan with the ground spices. This reduces the risk of burning the whole spices. 3. You can change the recipe and use ground versions of the whole spices listed. The ground spices will then be added later in the recipe with other ingredients as turmeric. For option 1, Heat the skillet over the heat mentioned in the recipe without oil. When the skillet is hot, add the whole spices in the order mentioned in the recipe, and cook them until they get fragrant, or change color or start to pop. Yes they will start to pop, it might take a bit longer than when cooked in hot oil. Once the spices are tempered, add a splash of water or broth to bring the temperature of the pan down so the spices do not burn and also to infuse the broth/water. Add onions or curry leaves or whatever the next step. Keep adding more water or broth to cook the onions or veggies and continue with the recipe. 1. Burnt spices: Dry roasting the spices to the expected outcome (popping) can easily go from roasted spices to burnt spices. Burnt spices will add a strong smoky bitter flavor that might or might not work with the dish. If unsure, roast the spices till just about starting to get fragrant or the slightest color change. If roasted whole spices always turn out bitter, use ground spices instead and add them later in the recipe when you add other ground spices. Or if you are not so particular about traditional flavors, add whole spices directly later in the recipe with liquids. Spices, whole or ground, dry roasted, oil roasted, broth cooked, or unroasted, add different flavors to the final dish. Find the flavors and method that work the best for you. 2. Order of roasting: Some spices roast and burn faster than other spices. Often the recipes will already have this information even when cooking in oil. If the information is not there, and there are many whole spices used in the recipe, you can dry roast each spice separately. Or if you know the general roasting times of the whole spices, then add them to the pan in order of longest to shortest roasting time. For eg mustard seeds will take longer to roast compared to cumin seeds. Larger spices will also take longer to roast. 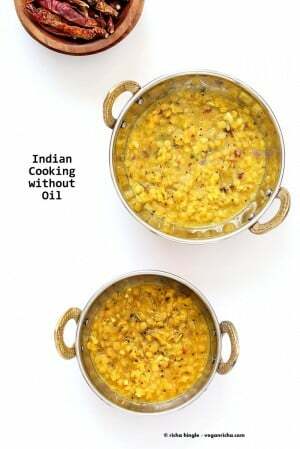 One of the below Dal Tadka has tempering made without oil and the other tempered in oil. They look pretty much the same. Taste wise, there will be a difference. The oil-free dal tastes better after a few hours as the spices take longer to infuse. You can cook ground spices in broth or lightly dry toast and then add broth or water. It depends on the recipe. If the ground spices are added later in the recipe, the contents of the pan might already be wet. If not, then mix the spices in broth/water and add to the skillet. If you often cook without oil, make your own ground roasted spices. Roast the whole spices like cumin seeds, coriander seeds until fragrant, cool, grind and store. Make small amounts to use up within a month or 2. This eliminates the need to roast the spices during the recipe. The pre-packaged spices might not necessarily be roasted. Use water or broth to saute the onions or vegetables until translucent or golden as the recipe needs. Depending on the pan used, the onions, veggies or tomatoes will have a tendency to stick or burn. Add additional water or broth to help reduce the sticking. I use Ecolution Terra pans, and they work beautifully for cooking oil-free. Nothing sticks on them if cooked at the right heat and the pans are cared for. Cast iron would also be a great choice. Asafetida (hing) is often tempered in oil with whole spices or right after the whole spices are tempered. Asafetida has a really fetid aroma and flavor. Once tempered however it becomes garlick-onion kind of flavor which supports the other flavor profiles in the dish. Without oil, you want to roast the asafetida on a dry skillet. Adjust the time when you add asafetida in the recipe so that, 1. it is roasted on a dry skillet 2. it is roasted only for a few seconds as it will burn quickly. Fresh Curry leaves have a beautiful flavor profile which is mixture of lime, coriander and other flavors. The strong flavor infuses the oil during tempering and is carried over to the dish. Often the leaves are discarded while eating (not before), as it depends on personal preference. Many people eat the curry leaves while most discard the leaves. Add curry leaves later in the recipe, as adding them at the step mentioned in With-oil recipe will only dry them out. Add them with the onions, or add them directly to the lentils/liquid. For my cookbook, I worked on all the usually fried recipes ( Fritters/Pakoras, Manchurian, koftas, Gulab Jamuns etc) to convert them to baked versions. The recipes were developed and optimized to make Crisp and similar texture and flavor baked results. Those recipes use a small amount of oil in the batter or for brushing during baking. They can easily be made oil-free by omitting the oil. Be sure to use parchment paper to avoid things sticking to the baking sheet. Aquafaba or non dairy milk brushed on will help things like kofta balls be more moist. In general, for baking Indian recipes that are deep fried, adjust the batter to be thicker than what is used for frying. To make flatbreads without oil, use non dairy yogurt in the dough to help keep the breads moist and pliable. Use a good skillet to cook the flatbreads. What are your tips to cook Indian or other cuisines oil-free? 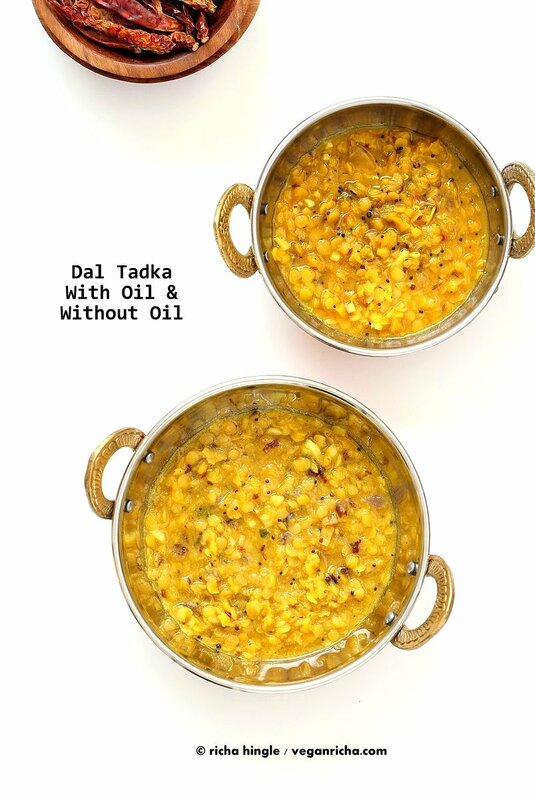 Get the recipe for Oil-free Dal Tadka below. Original with-oil Dal tadka recipe is in my cookbook Vegan Richa’s Indian Kitchen. Tips to get started with Indian cooking here. Oil free Dal Tadka - Restaurant style Lentil soup. Masoor Dal Tadka is one of the better known dals as it is generally available in Indian restaurants. Tadka, tarka, or chaunk are all words for the tempering, which is spices and herbs fried in oil and then mixed into the cooked lentils. This version is made oil-free. Wash and drain the red lentils. Add to a deep pan with water and salt. Bring to a boil on medium heat, then cook on medium-low heat for 12-15 minutes or until lentils are tender. Keep them on a low simmer. See Note for Instant Pot instructions. Heat a skillet over medium heat. Add onion, garlic, ginger and a pinch of salt. Mix and cook for 6 to 8 minutes or until golden brown. Add a splash of water or broth if the onions begin to stick or brown too quickly. Add turmeric, coriander, garam masala and fenugreek leaves. Mix and cook for half a minute. Add a splash of water if sticking. Pour this into the cooked simmering lentils. Heat a clean skillet over medium heat, when the skillet is hot, mustard seeds and cook for a few seconds. Add cumin seeds and mix. Cook until the cumin seeds slightly change color and get fragrant. The mustard seeds will change color but might not pop. Add red chilies, bay leaf and cook until the bay leaf starts to change color. Add asafetida and curry leaves and mix in (If you were using oil, asafetida + curry leaves would be added with the chilies). Add this tempering to the cooked lentils. Mix well and take off heat. Taste and adjust salt and spice. Add more water for thinner consistency. Serve hot garnished with cilantro, with Naan, flat breads or rice. Variations: add 1 cup finely chopped tomato at Step 1 along with lentils and water. Use 2 to 2.5 cups of other cooked lentils or cooked split peas. Instant Pot: Combine the drained red lentils, salt and water in the Instant Pot or pressure cooker. Close the lid to sealing and cook for 1 minute Manual on high pressure. Quick release after 5 minutes. For other split peas or whole lentils, adjust cooking time accordingly. Make the tempering (step 2 onwards) and fold in. Let me know in the comments if you have tips and tricks that you usually use to convert recipes to oil-free. Thank you so much for doing this post! because there isnt any. It probably is 0.05 or something and is rounded off to 0. That was a great post, thank you for sharing! I’ve been cooking oil free for a few years now. My favorite way to start most dishes is to use vegetable broth, a splash of Braggs Liquid Aminos and a teaspoon or more of a coarse prepared mustard. Mix it all around over medium heat, and when it starts to steam, start in with the onions and/or other veggies. Cover the pan and when the steam starts to escape from the sides, I turn the heat down to Med. Low and add the next veggies. I usually add most veggies together and try to cut them to a size so they will steam together evenly. Only the greens get added at the last minute. I’m looking forward to adding the dry tempered spices to my process. Thanks Vegan Richa! I’ve really been enjoying your cookbook. Awesome! I will use this to cook dishes that dont have whole spices. Oh, this is so helpful–thank you SO SO MUCH! Great Post. I try to use a minimum of oil but you have inspired me to try without any. I have a question – I am gluten free but not celiac. Is flour or something added to powdered asafoetida? If so do you have any idea whether it is a tiny amount or larger? I have never seen asafoetida marked gluten free. Hi Miriam, Asafetida the crystal resin is gluten-free, but it is usually ground with wheat or other flour/starch depending on the brand. There are some spice shops that use rice flour as the filler while grinding, so that ground asafetida would be gluten-free. worldspice.com is a spice shop in Seattle and they use rice flour, but they do use shared surfaces for grinding, which might be a problem for celiac, but not otherwise. You can order from them online as well. For whole spices, I would suggest using just a little bit of oil, as the tempering is much easier that way and the flavor infuses really well through oil, compared to dry toasting. I am celiac and got the Asafedida from worldspice.com. I didn’t realize that they use shared grinding surfaces but have not had any issues using it. Such a tiny amount is usually used when I cook, that may dilute it enough for the body not to notice. thats good to hear Laura. I am sure they are probably careful about contamination, but do have to still mention about the shared surfaces as the contamination can happen at any other time as well. Thumbs up! Thank you for the post, Richa. I am enjoying your cookbook, Richa. I am just learning about Indian cooking, and love the flavors. I have to say, though, that the smell of asafoetida must be acquired. I hardly noticed it in the recipe, but I have to keep the container in the outdoor garage. Thank you for this lesson in cooking with so little oil. I also love watching the whole spices jump around in the pan. It makes me feel like a magician. Hi Irene, Thanks for getting the book! Yes asafetida indeed is a strong smell. Keep in in a double sealed container. Quite often asafetida is used not for flavor but to help digestion as the dals and beans are gassy. The popping mustard seeds add an amazing flavor! Hmm…so does this mean that I could safely leave out asafetida in this recipe if dals and beans don’t give my family trouble? Asafetida is used both for helping dals and beans easily digestible as well as adding flavor. When not the major source of flavor in a recipe, you can generally leave it out. 1. Red lentils? The picture looks more like a yellow (Moong) lentil. My red lentils are really red and really small. What am I missing? 2. Is dried fenugreek leaves the same as ground fenugreek? 3. If I don’t have the curry leaves, should I just omit or is there a substitution? I know not to use curry. Thanks again, Richa. I love your cookbook and recipes. 2. ground fenugreek is ground fenugreek seeds , not leaves, and are stronger flavor profile. To sub the dried leaves with ground seed, use a 1/4 of the amount mentioned. 3. I think what you mean is not to use curry powder as that is different from curry leaves. Yes, you can leave out the curry leaves. Add a dash of lemon at the end instead. Thank you, Richa, for clarifying that for me. For Oil free cooking I have dry roasted mustard seeds until they pop or turn dark in color, same with cumin seeds, same with urad dal and chana dal which we southindians use for seasoning (tempering). I store them in small glass jars and they are handy to use in any dish – northindian or southindian. Also the key to cooking without oil is not to cook on HIGH on the stove. Med-Hi or Medium is preferred. I still have problems cooking dry Okra (bhindi Sabji) and dry eggplant sabji. Any tips? Awesome! thats a great idea to pre-roast the whole spices and the heat. I think for okra, a good non stick pan would definitely help. or you can bake the okra. Toss in spices, salt and chickpea flour and bake until crisp. I appreciate that you share some oil free versions without ignoring those of us who do prefer to cook with olive or coconut oil. My herbalist points that turmeric is better absorbed when taken with a little fat, as are many other nutrients. So if you don’t need to be oil-free as a therapeutic diet, most people shouldn’t feel guilty about that splash of oil in their nourishing lentil dal! Hello Richa, I thought that Oil free Good for Our heart but can we Use Olive Oil in our Food? , Because We Are Indian Never Compromised with Taste ..
Hi Chirag, olive oil doesnt work very well for high heat cooking that is needed to temper the spices. Use any high heat organic non-gmo oil like safflower, canola, coconut or other. Use less amounts as the spices and good pans need only a little bit of oil. My maid always cooks with lots of oil in my food. I was really looking for something like that. Thanks so much for going over how to cook Indian dishes without oil. I just purchased your cookbook and I love it! I made the mung bean and spinach curry tonight and my husband, son, and I loved it–so delicious! I also appreciate the cookware recommendation as I want to ditch my teflon pans, but wasn’t sure what to replace them with–so thank you thank you! Awesome! So glad you loved the mung dal and spinach curry. The cuisinart pans are really good for all the cooking I do. they hardly need any oil and clean off so quickly. We are lucky to have an Indian market nearby, so I went there and bought just about everything I need for many of the recipes I want to do in the book. For $30 I have a good start on having an Indian kitchen. I usually buy and use the boxed spice mixtures, but the whole spices aren’t difficult to grind and use and the shelf life is so much better. I use a whirly-blade coffee grinder and prepare only what the recipe calls for. I have spoiled recipes in the past by using old spice mixtures out of the box. My first recipe was Restaurant Style Lentil Soup. Wow! I never had soup that good in a restaurant. A better name: Better Than Any Restaurant Lentil Soup. Very nice book. Thank you. Yes whole spices have a much better shelf life and the freshly ground spices are so much fresher and stronger flavor. So glad you loved the Dal Soup! Yes, grind them to a powder and use a scant 1/4 tsp. I’ve made dhal without oil (not your recipe; this is not a comment or anything about your particular recipe in any way)…and the food has been completely tasteless 🙁 What am I doing wrong? Or…is this basically the way it’s going to be w/out oil…. It depends on the recipe, your method, spices used etc. Were the spices toasted in any way? Was the dal simmered with the spices for some time? With no oil as the infusion medium, you have to be sure that the whole spices get roasted enough to release flavor, esp spices like mustard seeds. cumin seeds will release a little flavor even if not roasted, but mustard seeds wont. Its hard to tell without the recipe. 1- add a bit more of the whole and ground spices, esp more of ground spices. 2- be sure to toast the spices well if the original recipe uses oil toasted spices. 4- maybe add a bit more salt. Salt enhances the spice flavors. some of the spices when roasted in oil also add a saltier flavor profile to the entire dish. 5. the spices take longer to infuse, so generally the dish should be tastier after chilling for a few hours. Yes, dry roasted the whole spices… and simmered for a good length of time… Add a decent amount of salt, and even some lemon to enhance flavor, but it just tasted very bland :-\ even after refrigerating overnight. Thanks for the tips… will keep trying. :(can you send me a link to the recipe. Email it to me or message it to me on vegan richa facebook page. I was just going to e-mail you to ask about oil-free cooking and then I found this post on your site. Perfect! Indian food is so wonderful and it is so great to find your book that is tailored for the vegan cook. Although I’m trying to remove all oil from my diet and that makes the process a little more challenging. Looking forward to learning so much from your site and book. Thank you!! Thanks! Yes, there is amazing food in the book which is vegan and Indian or fusion. I did something wrong and it was very sour. I used all of ingredients, but might have burned the seeds? Also, the hinges was bitter tasting so maybe I should have left it out. I will try again. Yes, the seeds can burn quickly depending on the pan and temperature of the pan. Lightly toast them. Omit the hing, as it is an aquired flavor. a) why is vegan no oil organic india food so impossible to find at india restaurants right now? b) canola oil non-gmo still has roundup sprayed on it during growing process, and is hexane solvent extracted. a)I dont know. b) i would think organic non-gmo canola doesnt use round up at any stage. I have been cooking oil less Indian food for years. I do the roasting of spices like you have mentioned. I love all your recipes and made pastry with garbanzo over the holidays and it was a hit. Thanks for providing the frying hints. I got a new air fryer and want to try it out and will follow your suggestions. Thanks again for your healthy recipes. A little late to the party, but I have also been experimenting with this. Whenever I dry roast spices there is a remaining taste of “rawness”. I believe this is because many of the compounds in spices are not water soluable. So no matter how long you cook them in water you will never achieve the same taste profile. (Please correct me if I am wrong here). I am still trying different things. No fat would be ideal. But if you just want to get rid of the bitternes / raw spice taste you can also cook the spices in cashew cream. Soften a handful of cashews in boiling water for 20 minutes or cold water for 4-5 hours (or overnight) then blend them with a little bit of water (say 1/2 cup cashews to 1 cup water) until there are no lumps. So you get a thick and smooth milk or cream. Put the cream into a pan and bring to a boil. Add all the spices and cook for about 4-5 minutes. The cream gets really gloopy like a paste. What happens is that the water evaporates and the spices infuse their compounds into the cashew fat. Then just add the rest of the ingridients and cook. I have also had success with coconut cream, but prefer the cashews.